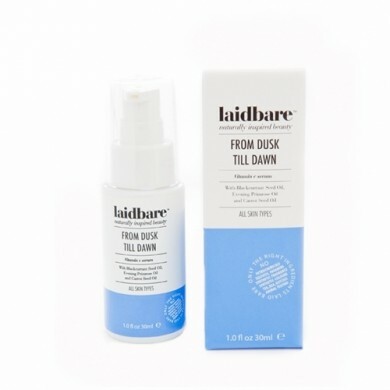 Laidbare From Dusk Till Dawn Night Serum restores balance to all skin types, from normal to sensitive to ageing or challenging. Blackcurrant Seed Oil is rich in Vitamin C, highly effective for dry, irritated, damaged and ageing skin. 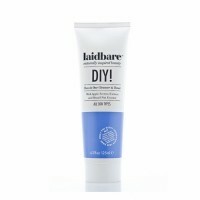 Equally wonderful for very dry sensitive skin types. Evening Primrose rejuvenates and helps to reduce inflammation. While Carrot Oil is beneficial for use on mature dry and sensitive skin. High in Vitamins A, B, C and E to aid skin sensitivities. Also known to restore elasticity and tone while targeting fine lines and wrinkles. For all skin types. How to use: One pump goes a long way! Massage gently over the face and neck. Most effective used at night, as Vitamin C degrades in sun light. Ingredients HELIANTHUS ANNUUS OIL, VITIS VINIFERA(GRAPE)SEED OIL, RIBES NIGRUM(BLACKCURRANT) SEED OIL, ROSA CANINA(ROSEHIP)FRUIT OIL, OENOTHERA BIENNIS(EVENING PRIMROSE)OIL, DAUCUS CAROTA SATIVA(CARROT) SEED OIL, TOCOPHEROL(VITAMIN E), PRUNUS ARMENICA(APRICOT)KERNEL OIL, LAVANDULA ANGUSTIFOLIA (LAVENDER) OIL. 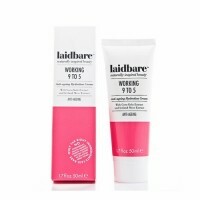 Madara Regenerating Night Cream is antioxidant rich moisturiser with skin regenerating extracts of N..